Schrade Knives began in 1904 as the Schrade Cutlery Company, founded in Walden, New York. Schrade Cutlery Company produced cutlery of a quality that was unheard of at the time, and the company grew and ultimately expanded its operations. Another knife-making company, the Imperial Knife Company, was founded in Providence, Rhode Island in 1916. The Imperial Knife Company manufactured a full range of value-priced folding pocket knives. In 1941, Albert M. Baer purchased the Ulster Knife Company, merging it with the Imperial Knife Company to form the Imperial Knife Associated Companies. Later, in 1946, Schrade Cutlery was sold to Imperial Knife Associated Companies, and the conglomerate was renamed to Schrade-Walden Cutlery Co., Inc. In 1983, Albert M. Baer took the company private to avoid a hostile takeover, and renamed the company Imperial Schrade Company in 1985. Today, the intellectual property (including all patents and knife-making concepts) of Imperial Schrade Corporation is owned by Taylor Brands LLC. In a further plot twist, Taylor Brands LLC was purchased by firearms maker Smith & Wesson in July 2016. While growing up in Kingsport, TN, Stewart Taylor was an avid collector of old knives, daggers and swords. Taylor begun selling knives when he was a student at Emory & Henry College. He published an advertisement in “Coin Magazine” for a Coca-Cola bottle-shaped knife which cost him $10 and was able to sell it for $25. His entrepreneurial journey had begun. He graduated in 1974 and started in the knife business by 1975, working with Asian manufacturers. Fast forward to 2004 when Taylor Brands acquired the rights to produce Schrade knives as well as the Uncle Henry and Old Timer trademarks. Taylor decided that production of all Schrade knives would be based in Asia, primarily China and Taiwan. Unfortunately, in doing so many knife users and enthusiasts declared that the high quality and craftsmanship previously associated with the Schrade knives had deteriorated. Without doubt, it was a sad day when Schrade closed it’s US based factory. Prior to the takeover by Taylor Brands, Imperial Schrade has maintained dominance in the knife industry primarily by the strength of its workforce. Imperial Schrade is known for its strong workforce and talented craftsmen, many of whom are third- and fourth-generation employees. It is common with the Schrade name for grandchildren to learn the knife making trade from parents and grandparents, passing along generations of skill and talent to maintain a rich heritage of crafting fine knives. Imperial Schrade also keeps up with the latest technology, merging its decades of experience with the latest tools and trade practices. Imperial Schrade was known for their pocket knives, especially their folding knives and fixed hunting and fishing knives. The company produced a fine line of some of the best diving knives in the industry. Their most popular knife, though, is probably the [amazon template=keyword&text1=schrade old timer&text=Old Timer], which was manufactured by Imperial Schrade for decades. These knives feature between two and four blades, with a distinctive appearance that you can probably remember seeing in your grandfather’s hand during your childhood. 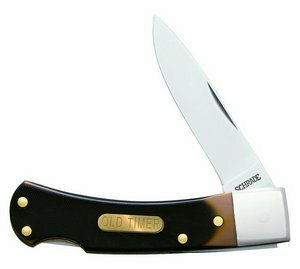 The Schrade Old Timer is a durable knife, probably durable enough to span generations. The Old Timer is made from traditional cutlery steel and stainless steel, and the handles are crafted from Delrin or Staglon, both very durable materials. The Old Timer is almost unbreakable and shockproof, and is backed by a lifetime warranty. The next popular name in Schrade pocketknives is the [amazon template=keyword&text1=schrade uncle henry&text=Uncle Henry]. Like the Old Timer, the Uncle Hendry was made with superior materials and expert craftsmanship. These knives have also been carried by Americans for decades, and are prized for their durability and value. 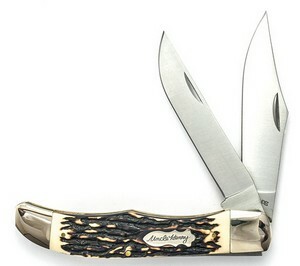 The Uncle Henry typically comes with one or two blades, and is made with a stainless steel blade and Staglon handle scales. Also in the Uncle Henry lineup are a number of fine-quality fixed blade hunting knives and skinning knives, used by hunters and fishers for many years. Note – to ensure the highest quality consider buying a used Schrade knife which bears the “USA” stamp. That brings us to some other popular knives in the Schrade lineup today. Unlike the original Uncle Henry and Old Timer knives, we recognize that not all Schrade knives today may not necessarily be made from the finest materials and are crafted by knife makers with decades of experience. Still, perhaps my favorite Schrade knife (other than the original Old Timer) is the [amazon template=keyword&text1=schrade extreme survival&text=Schrade Extreme Survival Knife]. This knife is made from 7Cr17 high carbon stainless steel, and is powder coated black for excellent conceal ability. The Schrade Extreme sports Micarta handles, and a 6.4” blade length and 5.6” handle length. The knife weighs 1.1 lbs., and comes with a nylon sheath. The blade holds its edge quite well, and can be sharpened to a razor-sharp edge. The Schrade Extreme comes as a fixed blade or an assisted opener, and either one is a decent choice for a survival knife. A somewhat unique offering, Schrade also manufactures an “out-the-front” assisted open spear point knife for EDC use (the [amazon template=keyword&text1=schrade schotf&text=SCHOTF series]). This knife features an AUS-8 high carbon stainless steel double-edge spear point blade that holds a razor-sharp age quite well. The black insert bubbled overlay provides excellent grip, and the knife is sharp enough for most tactical and EDC uses. The knife is great for first responders and hunters, as well as anybody who wants a highly functional EDC knife with a glass break tool and terrific blade.